The Ecological Angler - Coho Without a Creek. Spawning coho these days is no easy task. Think of the "algorithm" at a dating site like eHarmony.com, and instead some sort of emotional/psycho matching, think genetics. When it comes to a dating service for coho in California, it's all about avoiding inbreeding. 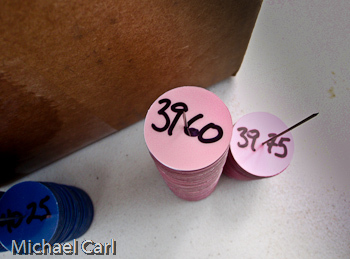 (I'll attempt to explain the how and why behind the genetic-match-making in a later posting.) Now, look into one of those domed pools with a couple hundred adult coho swimming, and find a pair that is on the list to be spawned. You say, "But, they all look alike." And without a number or some external ID, it's virtually impossible to tell these players apart. Enter the disc-tag (pictured above). Each coho destined to produce the future of their year class will receive one. In this picture the pink colored tags will be for the hens, and the dark-blue for the bucks. But, placing the tag is only part of the job. Each coho placed into a captive broodstock program like this is already tagged. This tag, however, is beneath the skin and is know as a PIT Tag (stands for Passive Integrated Transponder). The fish are implanted with a PIT device about the size of a large grain of rice which contains a code specific to that fish only. A hand-held device, known as a PIT Tag reader, can be placed within a couple of inches of the tagged fish, and that code displayed. PIT tags allow fisheries managers a way to record and track key attributes such as the origin and age of their broodstock. Enter the spreadsheet. The PIT tag tracks origin and age which are critical to know before you spawn. 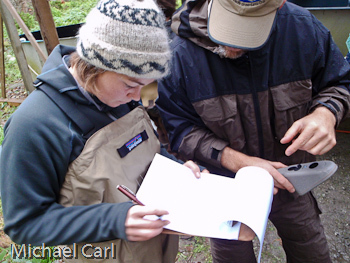 Using the PIT Tag reader, each coho in the broodstock pool is scanned and the code read out. A fisheries tech will then scan a spreadsheet and verify the fish is destined for the spawning process. If the fish is choosen, then the tech takes a disc tag and records the number next to that line in the spreadsheet. 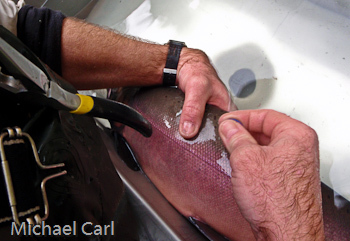 The final steps include piercing the coho with a stainless steel needle below the dorsal fin and attaching the disc-tags. After the tagging, each fish is measured and weighed. Their measurements recorded for future analysis. Next entry - Do you want to know what *it* is?